Garden of Aaron: Have You Seen These Bushes? 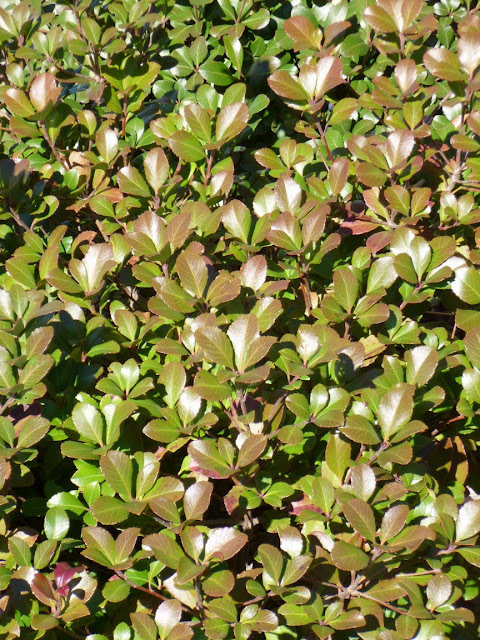 Foliage on one of the mystery bushes living next to our house. These bushes have been minding their own business ever since we moved into our home nearly two years ago. Here's more of a 'big picture' shot. The two bushes closest to the camera are (I believe) the same. The one further away is different, I think. The one farthest from the camera gets blue berries, fyi. They do not do anything spectacular, but they seems tough, reliable and very happy living next to the house with Western exposure - yet in the shade of a large crape myrtle. 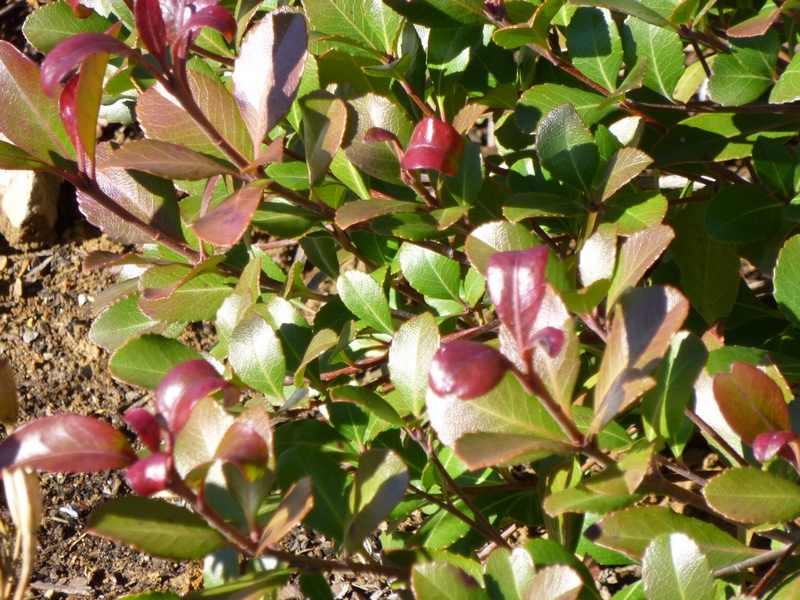 New winter growth emerges red-tinged, later changes to green. I have no idea what the bush might be, but I'd like to know, because it seems kind of bulletproof so far. As you can see, the new (winter) growth is kind of reddish. I'd estimate its size as 1-2 feet tall and maybe 4-feet wide. Any ideas what these might be? Thanks in advance for any suggestions! Hi Aaron....To me it looks like an Indian Hawthorn. If it is it would have leathery leaves with pink or white flowers in spring which are followed by berrylike dark fruits. They are common in CA and I have one here in my TN garden. I would have to agree with Christy. It originates from China and is used a lot in bonsai, it you like that sort of thing. 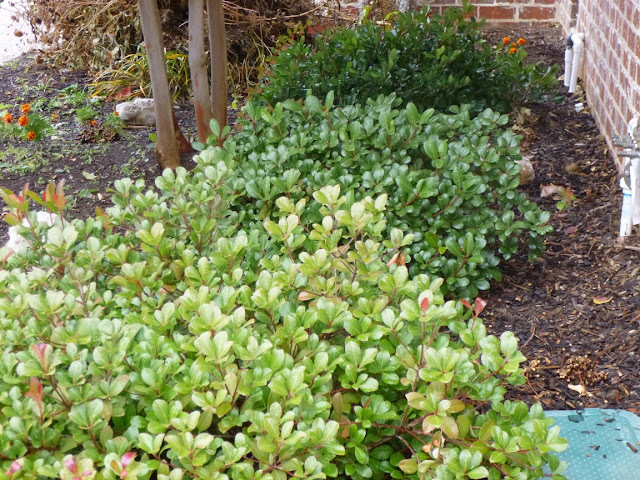 Very common in commercial landscaping in the southern US. Make it three for Indian hawthorn. I grew it in Georgia, and now with climate change might be able to grow it here in Connecticut. Great plant. Hey, is that a crape myrtle, one of my favorite trees, in the second photo? I'll pay close attention this spring and let y'all know. I cross-posted this same blog post over on Google+ and a gardener there suggested they could be some sort of holly. Does that sound at all plausible to y'all? Hi Aaron...I'm sticking with the Indian Hawthorne. The one I have here is 7 years old. It's called "Bay Breeze". It has pink flowers, however there are never many of them so they could be missed. Mine also doesn't have many berries and the ones I do see aren't in clusters. I love Crepe Myrtles. I have two pink ones at the entrance to my driveway and last year I bought a third one, deep, deep red, and planted it in one of my new flower beds.